I saw a version of this beautiful piece of writing on Facebook, of all places, but after digging a little I believe I found the original article – more like poetry, really – written by the former Surgeon General of the Navy, VADM Harold Koenig. Here it is in its entirety. Vice Admiral Harold Koenig, USN (Ret), M.D. I like the sounds of the Navy – the piercing trill of the boatswains pipe, the syncopated clangor of the ship’s bell on the quarterdeck, the harsh squawk of the 1MC and the strong language and laughter of sailors at work. 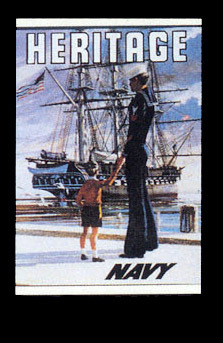 I like the lean angular names of Navy ‘tin-cans” Barney, Dahlgren, Mullinix, McCloy, -mementos of heroes who went before us. I like the surge of adventure in my heart when the word is passed “Now station the special sea and anchor detail – all hands to quarters for leaving port”, and I like the infectious thrill of sighting home again, with the waving hands of welcome from family and friends waiting pierside. The work is hard and dangerous, the going rough at times, the parting from loved ones painful, but the companionship of robust Navy laughter, the ‘all for one and one for all’ philosophy of the sea is ever present. And I like drifting off to sleep lulled by the myriad noises large and small that tell me that my ship is alive and well, and that my shipmates on watch will keep me safe. I like quiet midwatches with the aroma of strong coffee – the lifeblood of the Navy – permeating everywhere. I like the traditions of the Navy and the men and women who made them. I like the proud names of Navy heroes: Halsey, Nimitz, Perry, Farragut, John Paul Jones. A sailor can find much in the Navy: comrades-in-arms, pride in self and country, mastery of the seaman’s trade. An adolescent can find adulthood. In years to come, when sailors are home from the sea, they will still remember with fondness and respect the ocean in all its moods -the impossible shimmering mirror calm and the storm-tossed green water surging over the bow. And then there will come again a faint whiff of stack gas, a faint echo of engine and rudder orders, a vision of the bright bunting of signal flags snapping at the yardarm, a refrain of hearty laughter in the wardroom and chief’s quarters and messdecks. Gone ashore for good they will grow wistful about their Navy days, when the seas belonged to them and a new port of call was ever over the horizon.